Are extracurricular activities and demanding work schedules getting in the way of your family meals? Despite the potential benefits, 25-33% of families report rarely, if ever, eating together as a family. Families who frequently eat meals together are more likely to eat healthy balanced meals, have higher intakes of fibre, fruit and vegetables, and have lower intakes of fried foods, soft drinks, and saturated and trans fats. Frequently eating family meals together may also reduce the risk of substance abuse and improve social adjustment in adolescents. Increasing the opportunities for your family to enjoy meals together requires a team effort. Everyone in the family can participate. Eat meals together as often as possible. Involve the whole family in planning meals ahead of time. Give everyone a role in meal preparation. Preschoolers can wash vegetables and set the table. 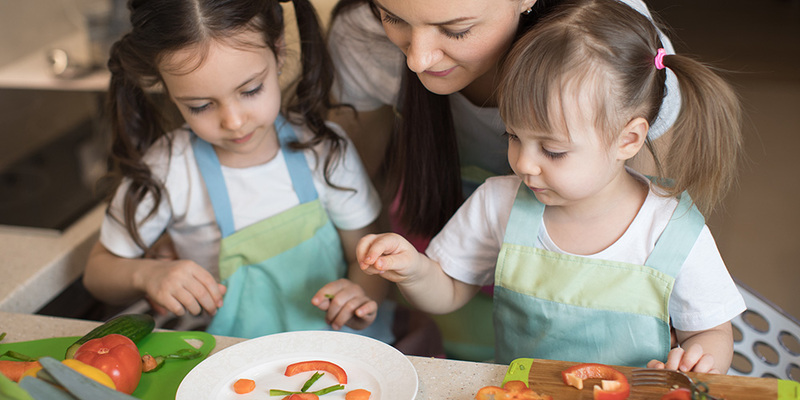 School-aged children can read recipes, gather, measure, and mix ingredients. Older children can take responsibility for one part of the meal (such as a salad or vegetables). Have the first person to arrive home get the meal started. Have everyone help with clean up. Adopt a flexible meal-time to accommodate changes in evening schedules. Make sure there is a healthy snack available for days when your evening meal is later than usual. Don’t forget to turn the TV off during your meals. Watching television during meals may counteract the benefits of eating together as a family. Are you looking for more information about nutrition? Try the Dietitians of Canada’s interactive tool called the Recipe Analyzer at www.eatracker.ca. Plug in the ingredients of a favorite recipe and it gives you a nutritional analysis that includes a full nutrient profile, the number of food guide servings and tips on how to change the recipe to make it more nutritious. On the same website, you can select “Track Your Activities” to track your day’s food and activity choices and compares them to guidelines set by Health Canada.